VoipZip is developed to reduce bandwidth consumption of VOIP with a special compression method without any sacrifice of voice quality! Turn Key Solution for your bandwidth optimization of VOIP! VOIPZIP is the best Session Bandwidth Optimizer (SBO). It reduces your internet bandwidth without any sacrifice of voice quality, VOIPZIP is the right product which will provide advanced efficiency. VOIPZIP is developed to Reduce Bandwidth Consumption (RBC) of VOIP with a special compression method without any sacrifice of voice quality! 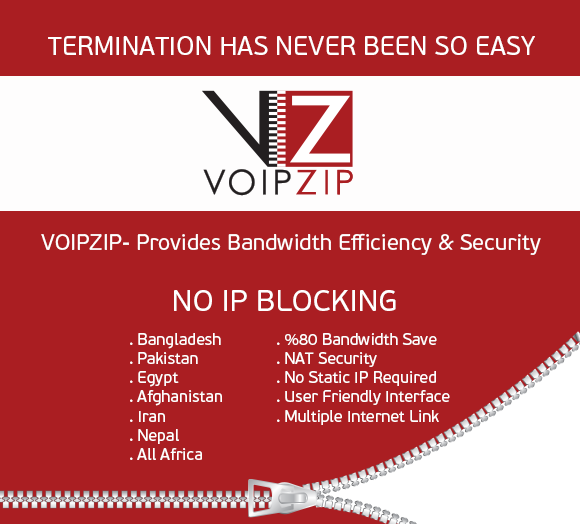 VOIPZIP is a key solution for Reduce Bandwidth Consumption. VOIPZIP’s Reduce Bandwidth Consuption feature provides you effective internet using. Please download our catalogue to find out our features. VOIPZIP reduces bandwidth consumption comparing to standards by 5 times. The idea behind the solutions is not to compress the voice packages, but RTP which is not an related with the sound quality. So the dream comes true that the theory of G729 consumes 8kb/s and g723 consumes 5kb/s per channel. VOIPZIP provides high level security behind the internet. It works like tunneling which bypasses all types of firewall and securities. Comparing to other solutions like VPN, VOIPZIP leads the bid with its voice oriented solution which makes it much reliable and cost efficient product. VOIPZIP provides additional features to variety of internet connections like: DSL, Wi-Max, Wi-Fi, 3G or Satellite. Even if there is no Static IP option, it is not an issue.